About the Author: Daniele Rossi lives in Toronto, Canada and watched cartoons, drew comics, and stuttered all his life. 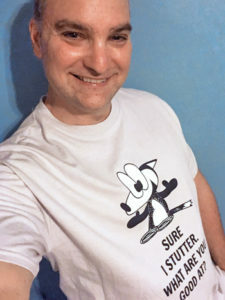 Daniele produces the Stuttering is Cool podcast and authored a stuttering survival book of the same name featuring comics starring Franky Banky, the fox with a vox that blocks! Daniele also co-founded Stutter Social, an online community facilitating group video chats for people who stutter all over the world and regularly appears on radio and TV programs to spread awareness about stuttering. Daniele is an advisory member to the board of the Canadian Stuttering Association and draws Franky Banky comics for the Association des bègues du Canada newsletter. In his spare time, Daniele enjoys strength training, amateur astronomy, animation history, planning his next adventure, and working on his upcoming Franky Banky book for children. I had a lot of fun creating this comic in the fun and zany rhyming style of the famous educational children’s book author, Dr. Seuss! As someone who draws comics, makes buttons, and wrote a book to encourage other people who stutter to reap the benefits of growing comfortable with stuttering openly, Dr. Seuss’ unique style was a perfect way for me to draw and write in a format that I haven’t tried before. Just like with stuttering. I used to try to hide my stuttering by switching words or not saying anything at all. I avoided speaking and even social situations only to end up making things worse like not ordering what I wanted to order and missing out on meeting new people. So I started trying something new — perform one act of courage after another in speaking situations by stuttering openly. Very quickly I began to reap the benefits of doing so. And I was finally able to speak my mind! 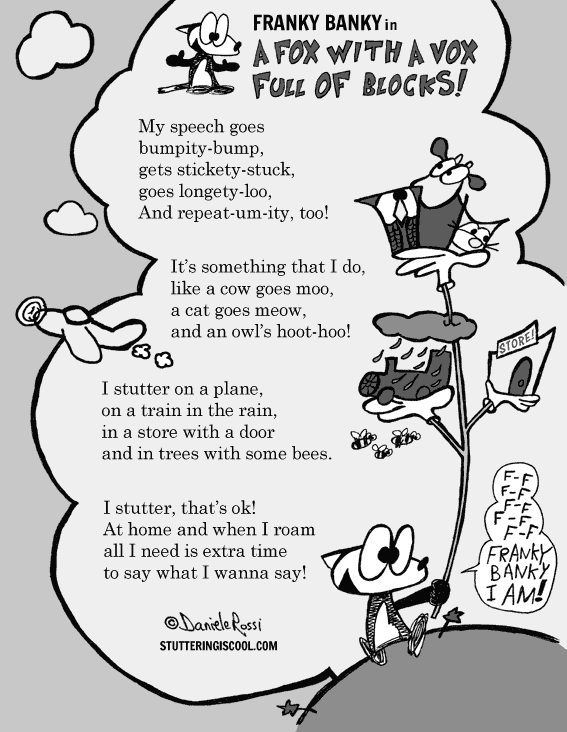 That is the message I am conveying in this comic and poem — stuttering is just something you and I do. It isn’t our fault. It is nobody’s fault. We can still communicate effectively since what we say is important, not how we say it. All we need is some extra time. And that’s not bad at all. The other message I am conveying is that stuttering is just one of the many things we do. For instance, the most fluent speakers in the world cannot be interesting if the only thing they can offer is fluent speech. What about their hobbies? Interests? Personalities? Are they great at playing an electric guitar? Do they volunteer their time at non-profit organizations? Do they bake awesome cookies and bring them to parties? Can they even tell a joke well? Are they dependable in times of need? I bet you are dependable, reliable, and have talents that others wish they had. It doesn’t matter if you like your stuttering or not. Just don’t let it stop you from saying what you want to say, connecting with others, and allowing your true self to shine despite having a vox full of blocks! Thanks Grant. You can never go wrong with Dr. Seuss. This would be great for schools (especially younger years) to have in their classrooms. Well done! Thanks Vikesh. There weren’t many cartoon stuttering role models I was aware of growing up so I hope Franky Banky can be the one for today’s and future kids. I love this message, Daniele! This is absolutely wonderful! Thanks for creating and sharing with us all! Thank you, Jaime. I’m glad you enjoyed it. So love Franky Banky! His honest emotions and the way he deals with it. He gives us, children awa adults great advice by sharing his own ups and downs. He is my super hero! And I have another great idea. 😉 Will send you a pm later. Happy ISAD and keep talking! You have such great talent in writing and drawing! While reading your comic, as a speech-pathology graduate student I couldn’t help but think how awesome this would be to share with young children in therapy. It describes stuttering in such an easy to understand way that will help any future stuttering clients I may work with. My question is what helped you the most to realize it’s okay to stutter? Was there a person that helped you talk about your feelings towards stuttering and helped you realize it’s okay to stutter? Quite simply, all it took was hearing others who stutter say that stuttering was ok and the idea of having friends who also stuttered. I’m a if-they-can-do-it-so-can-I kind of guy. While I enjoyed both the book and this poem, I wonder if you have gotten any negative feedback since your approach is comical/lighthearted with a condition that is serious. So far so good, Brianne — all positive! One piece of feedback I received said that my book was the first time she cane across a book about stuttering that had a sense of humour towards stuttering. Here’s a fun fact: I was nervous at first about writing the page numbers in stutter and almost left them out. But in the end, that small little detail ended up being one of the most common things readers enthusiastically compliment. I think the reason my book gets a warm reception is because it makes readers feel that it understands what they have been going through and the humour reflects that without being harsh or edgy. Thank you for sharing this post! I enjoyed reading your comic and learning about the two messages you wanted to convey from it. I feel that both messages are great to keep in mind and a great way to view stuttering! Your comic is such a good way to share stuttering with children. I feel that it describes stuttering in a fun and easy to understand way. I read that you draw these comics for a newsletter and that you are planning to create a Franky Banky book for children. That is great! What inspired you most to begin creating these comics for children? Did you have anything similar to these comics that influenced you when you were growing up? Thanks for enjoying my comic, Erin! A few years ago I was at an NSA conference and noticed that the majority of the kids wore superhero tshirts. There were Spider-Mans, Batman’s, Supermans, Captain America, etc. I though to myself that these kids need a superhero that stutters. So I decided right then and there that Franky Banky would be the one. Or at least a positive role model. As for influences, I’d say having read a lot of Peanuts as a kid and Bloom County as a teen/20 something and Calvin and Hobbes. Thank you for sharing this comic and what it means to you. I am an SLP graduate student, and have a school age client who stutters. This medium for talking about stuttering is fantastic. I plan on sharing it with him. I love that you wrote a whole book! Would you mind sharing where we could purchase the Franky Banky book? Is it out yet? I will definitely keep a look out on amazon for it. What inspired you to create comics for children who stutter? I’m happy to hear you’ll be sharing my parody with your school age client! My book is indeed available for purchase, but not on Amazon for the time being. I ship directly from my home! Details at stutteringiscool.com. See my answer right above your comment about what inspired me to create comics for children. Looks like that’s a popular question 🙂 I’d also add that in this case of the Dr. Seuss parody, when I first thought of the idea, drawing it for kids wasn’t on my mind. But a few seconds later, I realised (quite obviously) how this style would be perfect for kids. And what kind of message would I tell a little kid who stutter? Pretty much it’s just something you do and it’s nothing to feel ashamed of. Two simple little facts that fit perfectly in a short poem. Your talent is incredible thank you for sharing. The cartoon that you created is both very informing and also funny and entertaining. The way you are able to convey a certain message and also have such a lighthearted feel is great. This is a perfect way to get children to feel comfortable with who they are and to have someone to idolize. Thank you for your kind words, Cassandra! I love this, Daniele, thank you for sharing! I am currently working with a young boy who is learning to, as you say, perform one act of courage after the next as he learns to cope with a stutter. I think this comic would bring him great joy and hope. As a bonus he loves foxes!! Keep up the good work and if you don’t mind, I’m going to pass along your comic to some of my colleagues also working with young PWS. I love this message! Also, I really appreciate the fact that you used a format (Dr. Seuss) that kids are already familiar with, to reach kids who don’t have a lot written that relates to what they might be going through. Well done! Thank you for your compliments and sharing your story about your client. He sounds pretty awesome doing an act of courage a day! And I think it’s really cool that he likes foxes. And please feel free to share my comic with your fellow SLPs. You’ll be helping to spread words of encouragement! This is awesome! I love the message this sends as many kids (and adults) are encouraged to be, as you said, their true self. I admire your commitment to so many resources for people who stutter. I was wondering what encouraged you to participate in various platforms for stuttering foundations? Thanks! I’m not sure what you mean by participating in various platforms for stuttering foundations, but if you mean my work with Stutter Social, the CSA, the ABC, and my podcast, then I’d say that my encouragement is being able to use my creativity to help others who stutter. Thank you for creating and sharing such a fun comic. I love how simple and easily understood it is. I think that it could be a great tool for an SLP to use when both educating those who are unfamiliar with stuttering but also when encouraging a PWS to speak their mind and to be ok with their stutter. I also love in your discussion that you emphasize that stuttering doesn’t define a person who stutters, just like fluency doesn’t define a person who doesn’t stutter. You are completely right, we are all unique people with differences and we all have important things to say so we should say it and it shouldn’t matter how we say it! Additionally, I noticed in your discussion you mentioned you used to switch words or not talk at all so you could hide your stutter from other but now you have written a book to encourage PWS to grow more comfortable in stuttering openly. I’m curious, how did you get from point a (avoiding communication all together to hide your stutter) to point b (stuttering openly, sharing your story, and encouraging others to do the same)? I would love to better understand the steps a PWS can take so I can one day educate my future clients as an SLP. Thanks in advance. 4. Getting positive reactions by others when I stuttered openly after explaining that I stuttered. I enjoy your cartoons so much! I am a second year SLP graduate student and our professor showed us one of your cartoons on the first day of class! I want to work with children, so I really like the poem featured on this post. It captures your main point that stuttering is normal in a very kid-friendly way. With children, we spend a lot of time re-assuring them that stuttering is okay but then they go to school and are surrounded by fluent speakers. It can make believing that their speech is perfectly okay very hard to believe! Having poems and cartoons that are so Dr. Seuss-esque can make children feel accepted and reassured. What advice would you give to a child that feels outcasted due to their stuttering? Thanks for enjoying my cartoons, Tiffany. The speech therapy room and stuttering conferences and support groups are an oasis where stuttering is ok, understood, and not mocked. Once outside of the oasis, it’s a different story. Children and teens are at a stage in life when being like everyone else equals validation. Every kid/adult who stutters will have their own experiences and reaction which depends on many, many factors unique to each person. Thus, my advice would be to listen to the child and address how they feel. Let them know that there are many other kids all over the world who stutter just like they do and many adults. Things will get better. But children tend to think in the present 😉 To the child who feels outcasted, they need to understand that they can focus on the people and friends who do not outcast them. Everyone else just doesn’t understand. Speaking of which, let the child know that they can absolutely let other people know theystutter and it’s just something that’s a part of them like having blonde hair or brown hair or red hair. Daniele, this is such a wonderful cartoon! I’m currently in school to become an SLP, and I especially love the last stanza that gently introduces the idea of needing a little more time. Have you been able to hear any reactions from children who stutter when they’ve seen this piece? If so, would you be willing to share how they connected with it?